You can use subdomains to create unique, separate content areas of your website. For example, blog.yourdomain.com and shop.yourdomain.com. Subdomains are created using the Subdomains tool in cPanel. Click on Subdomains under Domain in cPanel. 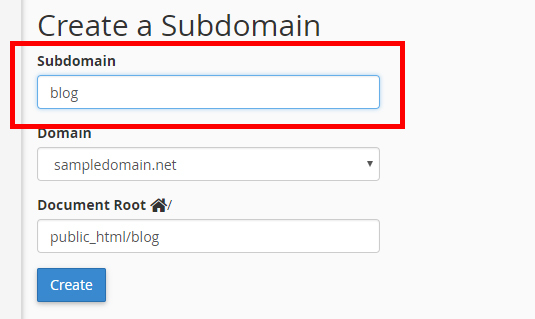 Under Create a Subdomain, enter the name of the subdomain you want to create in the Subdomain text box. cPanel automatically fills in the document root path by using the subdomain name you’ve entered. This path is where the subdomain’s files are stored. If you want to store the subdomain’s files in another directory, enter the full path in the Document Root text box. Think of it as a folder with the subdomain’s name. This folder will be created and placed in your account’s public_html folder – this is where you will upload files for this subdomain. You can now upload content to the subdomain by placing files in the subdomain’s document root.